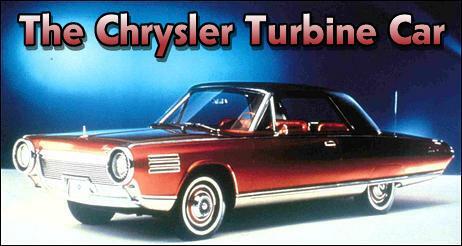 In 1963 the Chrysler Corporation built over 50 gas turbine-powered cars. Incredibly, they then lent them - free of charge - to normal citizens to drive for three months each, with comments and feedback encouraged at the end of the period. This photo shows the handing-over ceremony for one lucky family. So, 44 years ago, a number of people in the US were literally driving jet cars around on public roads - taking them to the supermarket, commuting to work, and probably parking them at drive-ins! And these weren't just 'pretend' jet cars - they were the real thing - engines revving at speeds of up to 48,000 rpm - they were certainly the only cars on the road that had tachos going to 60,000 rpm! Chrysler used the vehicles not only for real-life R&D, but also for publicity purposes. The company pamphlet produced at the time has a host of interesting details about the cars - here are some extracts. With the introduction of its turbine-powered car, Chrysler Corporation reaches a milestone in automobile design. The appearance of turbine cars on the public roads signifies an important point - possibly a turning point - in automobile evolution. The Chrysler Corporation Turbine Car is a 4-passenger hardtop, a luxury car in every sense of the word, equipped with power steering, power brakes, power window lifts, leather seats and trim, and a body structure designed to accommodate the gas turbine engine. Aside from its revolutionary engine and luxury appointments, the car has the normal configuration of an American automobile. The engine is in the front of the car and supplies power to the rear wheels. The car has the normal instruments found in a passenger car (driving enthusiasts will be glad to know it has an ammeter and oil pressure gauge as well as an oil pressure warning light). In addition it has an engine speed indicator and a temperature indicator with which the driver should become familiar. Most of the hand controls, including the automatic transmission control lever, are in a console at the driver's right hand. Otherwise, it has the foot braking and acceleration controls with which everyone is familiar. An automobile gas turbine must be quieter and have a lower exhaust temperature than an aircraft gas turbine. The automobile engine must be compact so it can fit in the engine compartment, and its manufacturing cost must be low so it is within the reach of the average automobile buyer. Thus it cannot use the high-temperature alloys, made of scarce and costly elements, that are used in aircraft. This is a big order, but Chrysler Corporation engineers have overcome these problems and have developed a practical automotive gas turbine. By developing a "regenerator"- a rotating heat exchanger - that recovers much of the heat from the exhaust gases, they have made it possible for the turbine engine to achieve good fuel mileage and low exhaust temperature, much cooler than a piston engine, in fact. To provide efficiency, flexibility and optimum performance over the full speed range, they have perfected a variable nozzle system for directing gas flow to the power turbine. The Chrysler regenerative gas turbine engine has two independent turbine wheels, one driving the compressor and accessories and one driving the car. It is a "regenerative" turbine because it utilizes two rotating heat exchangers - called regenerators - to recover heat from the exhaust gases, thus boosting fuel economy and reducing exhaust temperature. The gas turbine engine is rated at 130 horsepower at 3600 rpm output shaft speed and 425 lb-ft torque at zero output shaft speed. However, unlike a piston engine, which is tested and rated as an individual unit without transmission or accessories, the gas turbine power plant is rated as a complete package including transmission and accessories. Thus, owing to rating methods and torque characteristics, the 130hp turbine power plant gives performance comparable to a piston engine rated at 200hp or more. When the turbine engine is operating, the first-stage turbine rotates the centrifugal compressor impeller to draw in air and compress it. The compressed air is heated as it passes through the high-pressure side of the regenerators, and then it enters a combustion chamber (burner) into which fuel is injected and ignited. The burning fuel raises the temperature of the gases (a mixture of combustion products and air) and increases their energy level. These hot gases pass through the first-stage turbine driving the compressor and then through the second- stage turbine (power turbine) which drives the car. The gases leaving the power turbine pass through the low-pressure side of the regenerators, giving up heat to the regenerator honeycomb, and flow out the exhaust ducts. With two small regenerators, the engine is compact and has balanced temperature gradients on both sides. Intake air from the compressor is split into two paths, which pass through the regenerators and come together again at the burner. The hot gases from the burner, after going through the two turbine stages, also are split into two paths to flow through the two regenerators and then out through the exhaust ducts. The compressor and first-stage turbine, along with the burner and regenerator, are called the "gas generator" section of the engine since these components produce the hot gases that power the engine. The two turbine wheels are not interconnected mechanically, and thus one may rotate while the other is stationary. The first-stage turbine always rotates while the engine is operating, its speed varying from 18-22,000 rpm at idle up to about 44,600 rpm at rated power. The second-stage turbine, being connected directly to the car's drivetrain, rotates only while the car is in motion. Its speed ranges from zero at standstill to a maximum of about 45,700 rpm. Since the power turbine is rotated by hot gases and is not mechanically connected to the gasgenerator rotor, the power turbine stops whenever the car stops, and the gas generator continues idling. Thus the engine will not stall under overload. Both turbine wheels are axial-flow type (like windmills) and the hot gases are directed into each turbine wheel blade row at an angle by nozzles. A nozzle assembly made of a ring of fixed airfoil-shaped vanes directs gas flow to the first-stage turbine blades, and a ring of variable vanes directs gas flow to the second stage turbine. The variable nozzle system for the power turbine is one of the outstanding features of the Chrysler engine, permitting it to deliver high performance over the full speed range without exceeding safe temperature limits. At starting or idle, the nozzles are open, with the vanes directing gas flow in an essentially axial direction; as the accelerator pedal is depressed, the vanes turn to direct the gases in the same direction as the rotation of the power turbine. The nozzle angle varies with pedal position to provide optimum cycle conditions. In this manner, the direction of gas flow is always at an optimum angle for maximum performance and efficiency without reducing engine life. The vanes of the variable nozzle assembly are located on radial shafts that engage a ring gear, and the angle of the nozzle vanes is varied by rotating the ring gear through a small arc. The ring gear is operated by the accelerator pedal through a cam-controlled hydraulic servo actuator, which receives hydraulic power from a central hydraulic system. To provide engine braking, the hydraulic actuator receives a pressure signal from the transmission governor, which affects the angle of the nozzle vanes when the accelerator pedal is released. With the vehicle moving faster than 15 mph, releasing the pedal turns the nozzle vanes to a reverse angle, directing gas flow against the rotation of the power turbine wheel to slow up the car. If the vehicle is standing still or moving at less than 15 mph when the accelerator pedal is released, the actuator merely turns the vanes to their wide-open idling position. Engine power is varied by controlling rate of fuel flow to the burner. The fuel control contains a fuel pump, governor, pressure regulator and metering orifice. During constant-speed operation, the governor regulates fuel flow to the burner spray nozzle in response to accelerator pedal position. During gas generator acceleration, fuel flow is controlled by the pressure regulator and metering orifice. When the pedal is released, the control shuts off fuel until the gas generator rotor slows to idling speed; then the control permits fuel to flow at the idling rate. Fuel flow is automatically controlled during engine starting and is unaffected by accelerator pedal position until the engine reaches idling speed. The gas turbine engine can operate in all kinds of climates and geographic locations, and it can run on almost any liquid that flows through a pipe and burns with air. However, for optimum service, specific fuels recommended for the Chrysler engine include only diesel fuels, unleaded gasolines, kerosene, and JP4 aircraft turbine engine fuel. Leaded gasolines should not be used, except as an extreme emergency measure. Engine exhaust gases, after leaving the regenerators, pass out to the rear of the car through two rectangular aluminium exhaust ducts, emerging at a temperature of about 500 degree F (280 degrees C) at full power (depending on outside air temperature) and only about 190 degrees F (105 degrees C) when the engine is idling. Two cast-aluminium convergers, bolted to the regenerator covers, collect the exhaust gases from the regenerators and direct them into the ducts. The two exhaust systems are separate, one exhausting gas from the left regenerator, while the other carries exhaust gas from the right regenerator. The exhaust ducts extend to the rear, curve over the axle, and end just ahead of the rear end of the car. Each is supported by three flexible hangers. At the outlet end, the cross-section enlarges to slow up flow, and the upper surface of each duct curves to deflect the exhaust gas downward. Aluminium channels, bolted to the underbody parallel to the ducts, serve as skid strips to protect the underside of the ducts when the car passes over rough ground. In Chrysler's Turbine Car the excellent flexibility or elasticity of the engine is augmented by a 3-speed automatic transmission. This modified TorqueFlite transmission requires no slip device, such as a hydraulic torque converter, since the power turbine of the engine is independent of the gas generator. Thus the power turbine is connected through its reduction gear directly to the input shaft of the transmission, and a castiron adapter plate is used to mount the transmission to the engine. Since the engine cannot be started by pushing the car, there is no rear pump on the tansmission, and there is no front pump since pressure for actuating clutches and bands is furnished by the central hydraulic system. To maintain smooth shifting, the hydraulic circuitry of the transmission is modified to adapt the transmission to the output characteristics of the gas turbine engine. The driver of a Turbine Car will encounter new sensations, notably acceleration smoothness and the absence of engine vibration that he has become used to with piston engines. Otherwise, normal driving with the Turbine Car is the same as with any piston-engined car with automatic transmission. The driver has an accelerator pedal and a brake pedal. He pushes the accelerator pedal to go, releases it to reduce speed, presses the brake pedal to slow abruptly or to stop - just as in a conventional car with automatic transmission. However, because of the turbine engine and the modified automatic transmission, there are certain differences in care and handling of the turbine vehicle in special situations. The turbine engine will start easily under conditions that would thwart a piston engine (such as extreme cold). Its starting procedure actually is simpler than for a piston engine since the driver merely turns the key and releases it, and then all functions are carried out automatically. To assure easy starting, the driver should keep his foot off the accelerator pedal until the engine is running under its own power. Once started, the gas cycle reaches full-operating temperature almost instantly so that the engine can be driven immediately at high power if desired, without a warm-up period. The turbine car cannot be started by pushing. As a general rule, it should not be pushed under any conditions. It may be towed for short distances (through a car wash, for instance) with the engine shut off and the transmission control lever in any position except Start/Park. The turbine engine does not require water or antifreeze since it is "self-cooled" by air surrounding it in the engine compartment and by compressor air flowing through it. Chassis and body mechanisms should be lubricated according to the recommended schedules, which are similar to those for other Chrysler Corporation cars. Oil level should be checked at intervals and oil added if necessary. - Do not operate engine with car on hoist. - Do not operate engine with rear wheel jacked off ground. - Avoid sustained engine acceleration with wheel spinning on ice, snow, or mud.